Napolitano, F., Sirci, F., Carrella, D. & di Bernardo, D. Drug-set enrichment analysis: a novel tool to investigate drug mode of action. 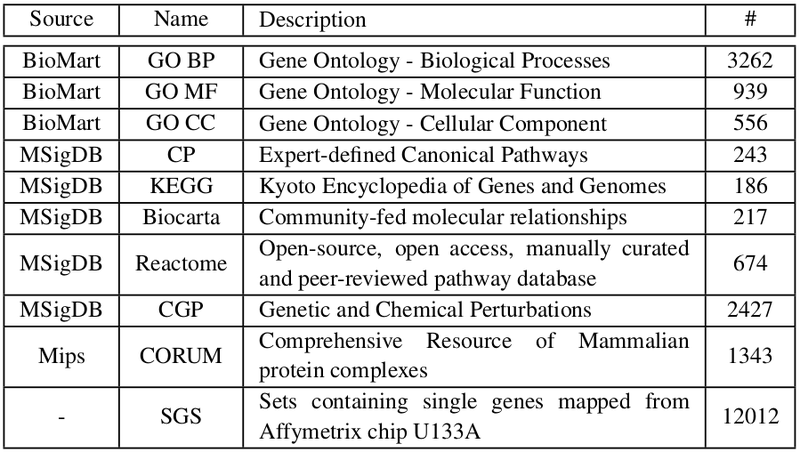 Bioinformatics (2015). doi:10.1093/bioinformatics/btv536. A common problem when screening small molecules against a desired phenotypic change is that the screening hits can form an obscure, chemically heterogeneous set of molecules. Structurally similar molecules can bind different targets. Structurally different molecules can bind the same target. Small molecules that bind the same target can induce different effects. Small molecules that bind different targets can induce similar effects. However, the molecular mechanisms behind the efficacy of the molecules found must share part of the cascade leading to the final observed effects. DSEA aims at highlighting this common path. The Drug Set Enrichment Analysis (DSEA) works on the same principles as GSEA, but using an inverse preparation and interpretation of the data. 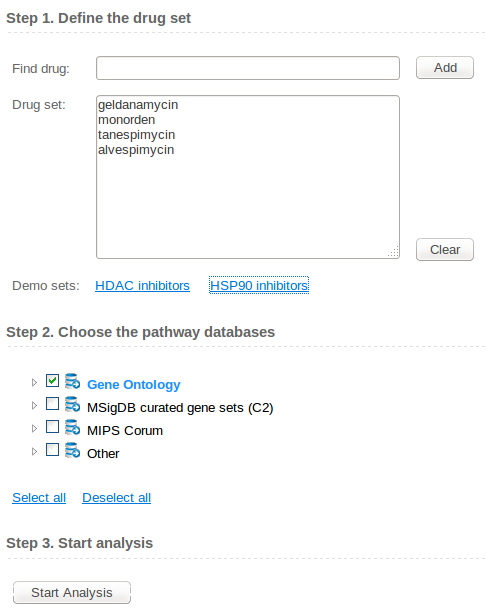 A set of drugs of interest is tested against a database of pathways. 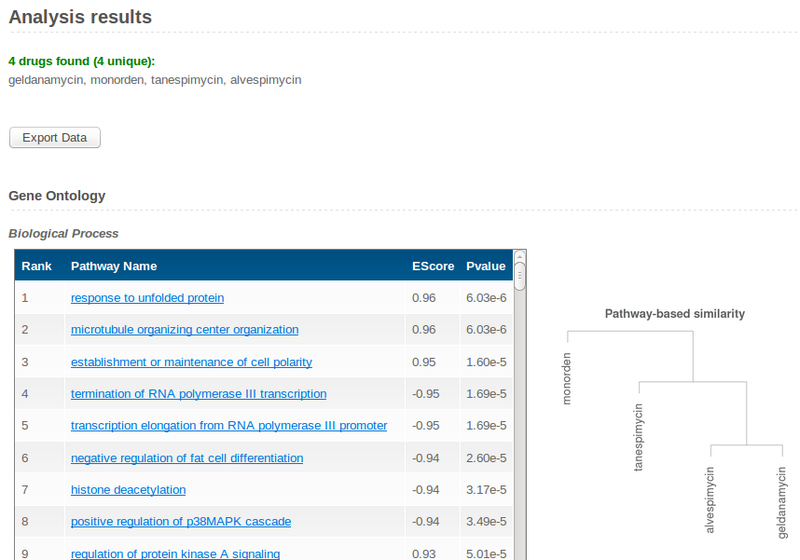 Each pathway in the database is stored as a ranked list of drugs (Perturbagen Expression Profile), sorted from the one most up-regulating the pathway (or gene) to the one most down-regulating it. Current data is based on the Cmap 2.0. DSEA tend to highlight pathways that are most dysregulated by a set of drugs of interest compared with the other drugs in the database. The importance of a drug-pathway pair is not based on the absolute dysregulation level of the pathway induced by the drug, but rather on the ability of the drug to dysregulate the pathway more than other drugs. This could be the key behind the efficacy of the screening hits and the inefficacy of the other drugs. 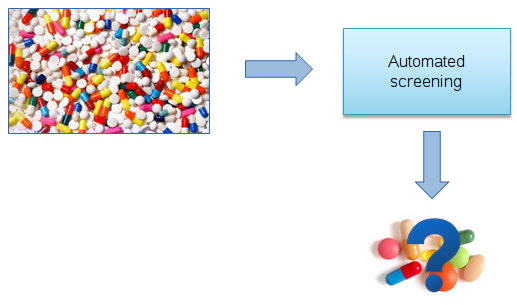 Create a drug set by selecting drugs from the Find box and/or directly pasting a list into the Drug set box (one per line)..
DSEA will be performed for all the pathways included in the chosen databases. Analyses on the different databases are independent. Click the Start analysis button to run the analysis and wait for processing (this phase should take 6 to 30 seconds, depending on the selected pathway databases and system load). A results page will be showed when finished. Results for each database are shown as separate tables, in which pathways are sorted according to relevance, together with the corresponding Enrichment Scores (ESs) and nominal p-values. Top 10% pathways are shown for each database. P-values assess how much the ranks of the chosen drugs are consistently small (up-regulation) or large (down-regulation) for each pathway. Positive ESs correspond to up-regulated pathways, negative ESs correspond to down-regulated pathways. Note that, due to cell adaptation effects, the direction of dysregulation could be opposite to that directly induced by the drug. A figure on the right of each table shows a hierarchical clustering of the drugs according to their similarities based on pathway rankings for each database. Similar drugs are those that up-regulate and down-regulate the same pathways. As soon as the Excel report of the results is ready, the "Export" button on top of the page will become active. Excel files contain all the database results as different sheets, together with additional information including individual drug ranks. While DSEA ranks (obtained through p-value sorting) range from 1 to the number of gene sets in the database, individual drug ranks range from 1 to the number of drugs. If a drug-pathway pair (D, P) has rank 1 then the drug D is the one most upregulating the pathway P as compared to the other 1308 drugs in the database. Importantly, this does not imply that P is the pathway most upregulated by D.
The data available on this site are in the public domain and therefore freely available. Nevertheless, this site and results made available through use of this site should not be used for the medical management of patients. Our group shall not be held responsible for your use of the site. 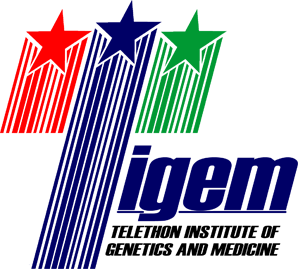 If you are interested in incorporating DSEA software into another product, or have questions or concerns, please contact us.